200 pages | 10 B/W Illus. 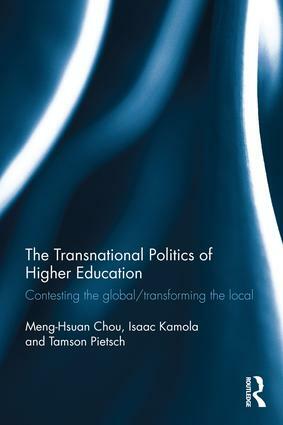 This edited volume introduces readers to the relationship between higher education and transnational politics. It shows how higher education is a significant arena for regional and international transformation as well as domestic political struggle replete with unequal power relations. The potential effects these developments have on the current structure of international political order. Drawing on case studies from across the Middle East, Asia, Africa, Latin America, and Europe, the contributors develop diverse perspectives explaining the impact of transnational politics on higher education—and higher education on transitional politics—across time and locality. This book is among the first multi-disciplinary effort to wrestle with the question of how we can understand the political role of higher education, and the political force universities exert in the realm of international relations. Meng-Hsuan Chou is Nanyang Assistant Professor in public policy and global affairs at NTU, Singapore and an Associate Fellow at the European Union Centre Singapore. Her publications have appeared in the Journal of European Public Policy, Politics and Governance, and PS: Political Science & Politics. Isaac Kamola is assistant professor at Trinity College, Hartford, CT. His scholarly work has appeared in International Political Sociology, African Identities, Journal of Higher Education in Africa, British Journal of Political and International Relations, Third World Quarterly, and Transitions as well as a number of edited volumes. Tamson Pietsch is an Australian Research Council DECRA Fellow at the University of Sydney. Her research focuses on the imperial and international histories of universities in the 19th and 20th centuries. She is the author of Empire of scholars: universities, networks and the British Academic world, 1850-1939 (Manchester, 2013). The core theme of the series is ‘global connectivities’ and the implications and outcomes of global and transnational processes in history and in the contemporary world. The series aims to promote greater theoretical innovation and inter-disciplinarity in the academic study of global transformations. The understanding of globalization that it employs accords centrality to forms and processes　of political, social, cultural and economic connectivity (and disconnectivity) and relations between the global and the local. The series’ editors see the multi-disciplinary exploration of ‘global connectivities’ as contributing, not only to　an understanding of the nature and direction of current global and transnational transformations, but also to recasting the intellectual agenda of the social sciences. The series aims to publish high quality work by leading and emerging scholars critically engaging with key issues in the study of global and transnational politics. It will comprise research monographs, edited collections and advanced textbooks for scholars, researchers, policy analysts, and students. Founding Series Editors: Sandra Halperin & Chris Rumford.